Gabrielle Esperdy explores built & natural landscapes in the U.S. The combined food wisdom of Jane and Michael Stern and John Edge is unlikely to steer one in the wrong direction. So it was with confidence that I decided to make a 25 mile detour from Eureka Springs in search of a hearty breakfast at the War Eagle Mill in Rogers. It wasn’t really even out of the way, though I ended driving those same 25 miles back to Eureka Springs because Thorncrown Chapel wasn’t open before I left. Highways 23 and 127 dropped down from the hills of the Ozarks into rolling farm land and War Eagle Road took me deep into protected lands. 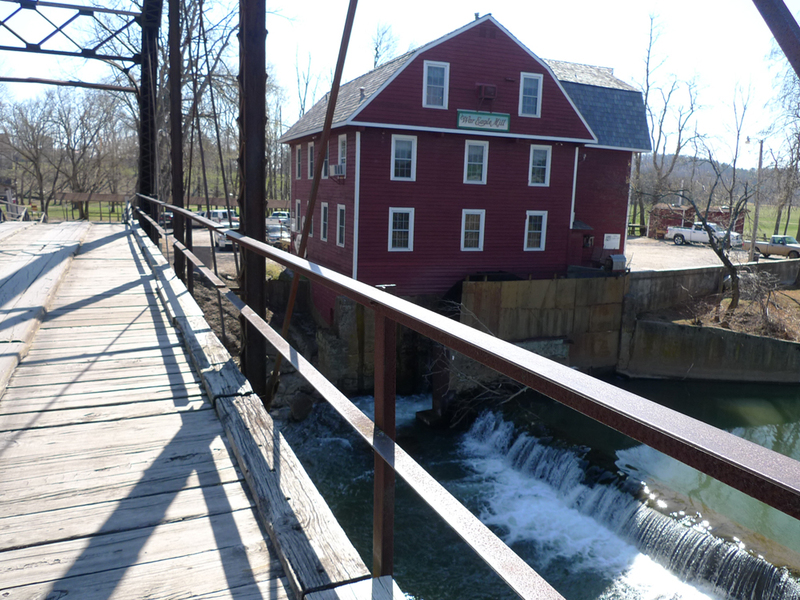 War Eagle Mill is the third one to occupy the site; it was built in the early 1970s on the foundations of the previous two. Supposedly, this three-story red clapboard structure recreates the approximate appearance of the original c. 1830. The unfortunately named Bean Palace Restaurant occupies the top floor. It’s a wide open room with picnic-like tables covered in plastic red checked table clothes. You order at the counter from a straight forward breakfast and lunch menu featuring the mill’s products and other local ingredients. 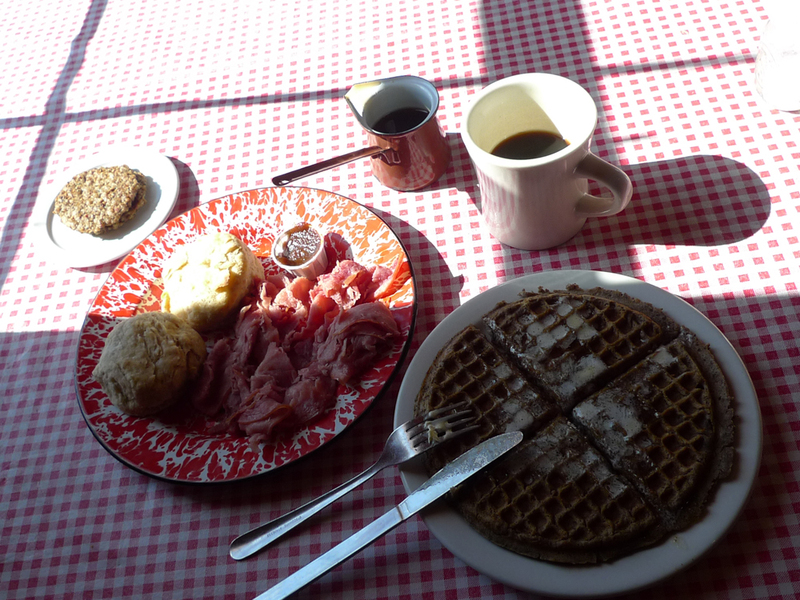 I ordered Breakfast #3, buckwheat waffles with sausage patties, but in the interest of sufficient sampling also added sides of biscuits and shaved ham. I ordered coffee too but it is not worth mentioning except to note that it was served in diner-style mugs of the classic Buffalo China variety. They were old and well-used but not chipped or stained and had precisely the right heft. As for the white liquid offered to lighten the coffee, well, it still perplexes: a non-dairy creamer called “Irish Creme.” I asked for something that came out of a cow but was told they had no milk. At any rate, my breakfast was brought to my table by a gentlemanly server who looked to be about 70. He was wearing a trucker’s cap and had a very long white beard. He appeared amused at the amount of food I ordered but was too polite to mention it. My buckwheat waffle was delicious and put to shame the very tasty buckwheat pancakes I had yesterday at the Pancake Pantry, a beloved Nashville institution. This waffle was crunchy on the outside and full of a dark nutty flavor. It was substantial but still light and with just a touch of maple syrup provided the perfect foil for the sausage patties. They were very thin with just a bit of spice and I didn’t need to be told that they were made from local pork. Oh noble pig! I sing your praises twice this breakfast. The shaved country cured ham was a mound of near perfection. Slightly sweet with just the right note of saltiness and thin enough to pass for a sort of rustic prosciutto. It was excellent by itself but very nice when accompanied by a biscuit. These were made from a hearty white flour (maybe a sort of light whole wheat?) with a nice crust and perfectly fluffy in the middle. My order of two came with a small paper cup of locally made apple butter to spread. I wolfed down one biscuit and half the ham (having already consumed my waffle and sausage patties) and carefully made a sandwich with the rest. I would surely need it later in the day to power me through my time in Bentonville, home of all things Wal-Mart. I really like the Map. Then again, I’m always humbled when I have to zoom out almost to the scale of the entire US before I can recognize where you actually are. We seem to have jumped a bit though, no tales of NJ Diners? I may be showing my devotion to the Food Network but thought before you hit the Mississippi on your way back you should take a look at Alton Brown’s “Feasting on Asphalt.” There may be better accounts of true American road food, but it could be a good place to start researching all the necessary fried food joints before you hit NYC again. I wish you could FedEx me a piece of that ham! It all sounds like a wonderful breakfast. It’s fun to read this. I’m knee deep in a paper, so also appreciate the mental break. Listen, did you bake the cookies for our anniversary? I have a friend who wants the recipe? Or does Julie know it, too? G – I’ve enjoyed reading your posts so far and agree that the breakfast looks wonderful. For the past two years I have been engaged in a quest to bake the perfect scone, which is similar if not identical to your US “biscuit” (which of course for us means “cookie” but that’s another recipe altogether). I wonder if, on your travels south, you could get some insight into baking the perfect biscuit? I’m still bamboozled by the basic questions ie. over cream vs. milk, shortening vs. butter etc. etc. G- The posts and pictures are fantastic. Of course it took the infamous breakfast to elicit a comment on my end. It is Sat a.m. and the thought of ham and sausage is further threatening my cholesterol levels. I particularly enjoyed your ‘Preamble Ramble’ and E, J and I watched the post card slide show more than once. Perhaps when you arrive in New Orleans you would like to visit with Ann Seiler (married name escapes me) and Ryan if time allows. Would you consider doing a sequel to the trip in the summer of 2014? E will be in college and I would love to accompany you. I’m already penning/typing it in.